Several users of electronic cigarettes have suffered moderate-to-severe injuries as a result of the device exploding. Pullano Law Offices in Chicago recognizes this new consumer risk and has already helped victims in receiving personal injury compensation from the parties responsible. Pullano Law Offices attorney Matthew Siporin recently helped a client receive a $186,000 judgment against an e-cigarette manufacturer after the client suffered serious burns when the device exploded. The case is still pending in the Denver District Court under case number 17 CV 30263. “At Pullano Law Offices, we aggressively advocate to make these products safer by ensuring that victims obtain justice and holding the wrongdoers accountable,” said firm owner Richard L. Pullano. According to a study by the U.S. Fire Administration, there were 195 reports of exploding e-cigarettes in the U.S. from 2009 to 2016. Of the 133 injuries from these explosions, 38 were severe. In May, a Florida man was reportedly the first person to die as a result of an e-cigarette explosion, according to various media reports. Faulty lithium-ion batteries are believed to be a source of the e-cigarette and vape pen explosions. Manufacturers know the risks of lithium-ion batteries. However, manufacturers are still selling these dangerous products and refuse to adequately warn people about these risks. They have put their profits ahead of the safety of the public. This must stop and the attorneys at Pullano Law Offices can help. Instances in which lithium-ion batteries explode are considered rare, but e-cigarette explosions can cause severe injuries. If the device explodes while in use, it can cause severe burns to the face and shrapnel damage from the device. The device is just as likely to explode while in a user’s pocket, which may cause the victim’s clothing to catch fire. If you have been injured by a faulty e-cigarette or similar product, you deserve personal injury compensation for your medical expenses and pain and suffering. Manufacturers, wholesalers and vape shops can be found liable for selling unsafe products to consumers. An attorney at Pullano Law Offices will work to determine which party is at fault and how much compensation you need. For more information, call 312-551-1100. Pullano Law Offices is a personal injury law firm located on East Upper Wacker Drive in downtown Chicago. The firm is dedicated to helping those who have been injured seek full justice. The attorneys at Pullano Law Offices are prepared to meet with clients anytime and place, and they know how to get results. The law firm has obtained millions of dollars in settlements and verdicts for clients and has become known for an uncompromising approach and a relentless work ethic. Attorney Richard L. Pullano and the team at Pullano Law Offices concentrate their practice on helping victims of personal injury. This includes cases involving, but not limited to severe car accidents, trucking liability, aviation liability, medical malpractice, nursing home negligence, bed sores, construction negligence, and product liability. 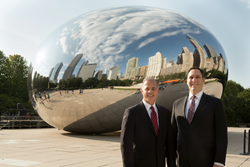 To learn more about the firm, call 312-551-1100.